The Mertz Glacier emerges from the mountains in East Antarctica in King George V land. The glacier is a true ice stream accelerating as it enters a pronounced trough. Berthier et al (2003) indicate an acceleration from to 100 m to 1000 meters/year as it enters the ice stream reach. The glacier then extends into the ocean with a floating tongue. This floating tongue advanced from 1956 to 2010 a distance of 43 km without calving indicating again a velocity of close to 1 km per day (Berthier et al, 2003). The floating ice tongue has only two means of losing ice calving and basal melting. Berthier et al (2003) indicate basal melting of 11 meters/year. 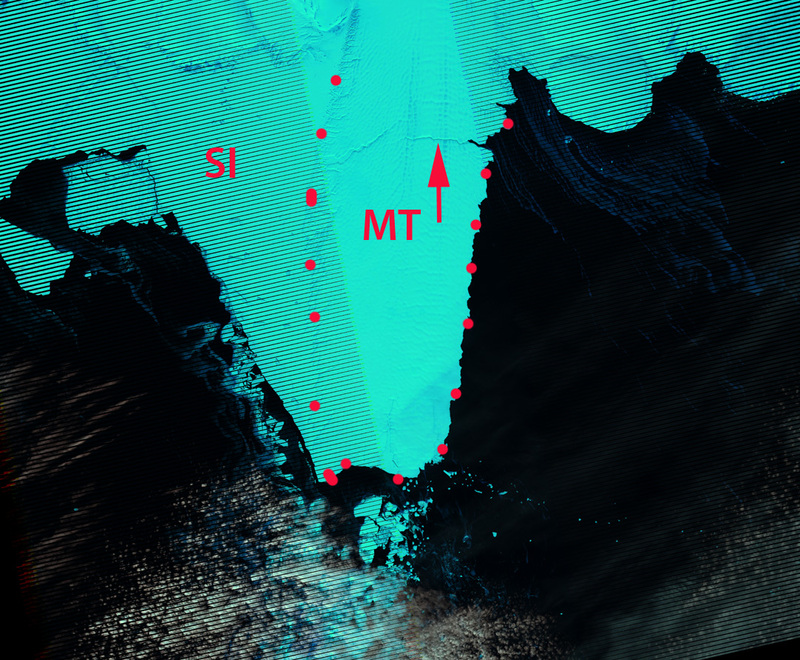 Depoorter et al (2013) indicate that basal loss is small compared to calving flux for Mertz Glacier, this is due to lower melt rates than under other ice shelves and ice tongues. 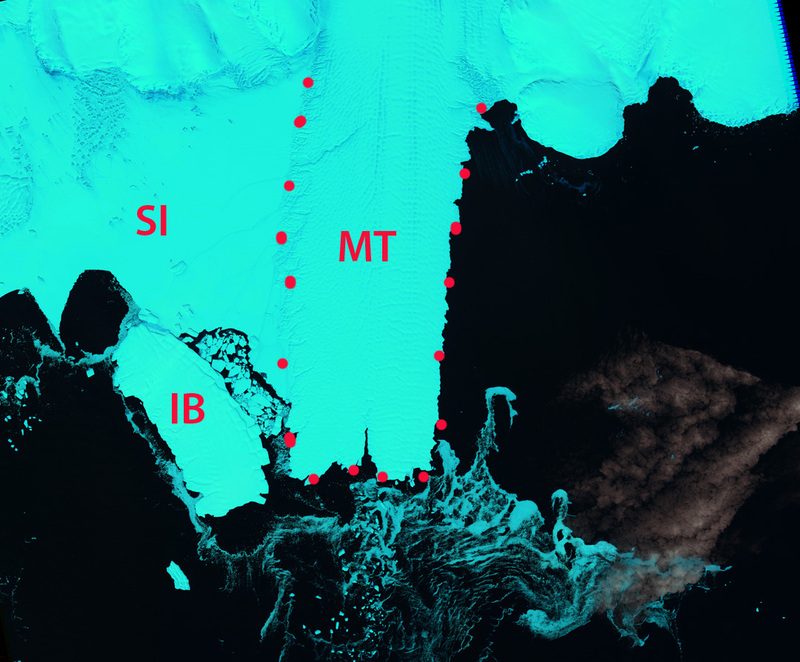 The tongue was impacted by the B9B iceberg causing the Mertz Glacier tongue to calve off an iceberg that was 78 km long and 35 km wide(Young et al, 2010). Impact image from Young et al (2010), Mertz Tongue left B9B right. Tamura et al (2012) noted that the abrupt change to the regional icescape resulted in decreased polynya activity and sea ice production. Calving of the Mertz Glacier Tongue (MT) in February 2010 altered the regional distribution of ice and reduced the size and activity of the polynya. 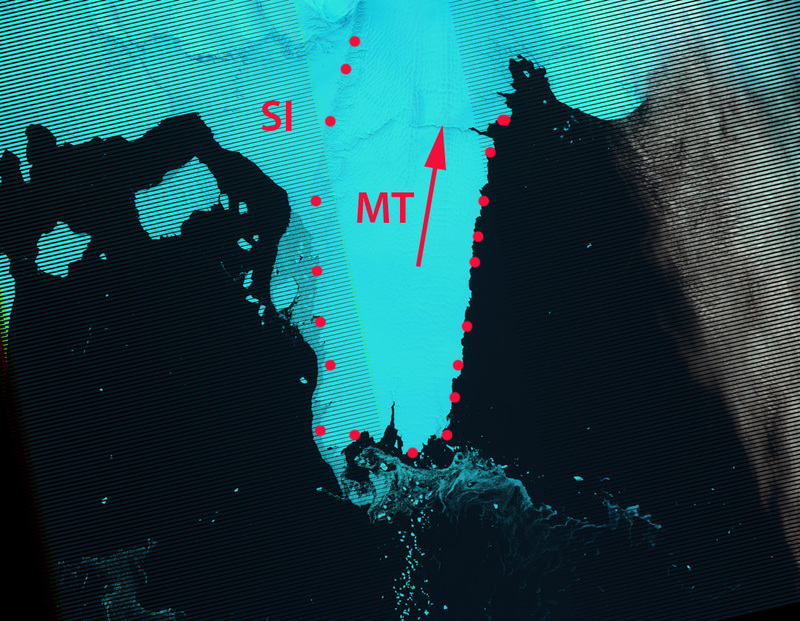 Shadwick et al (2013) noted that the calving of the Mertz Glacier Tongue altered the regional distribution of ice and reduced the size and activity of the Mertz Glacier polynya. 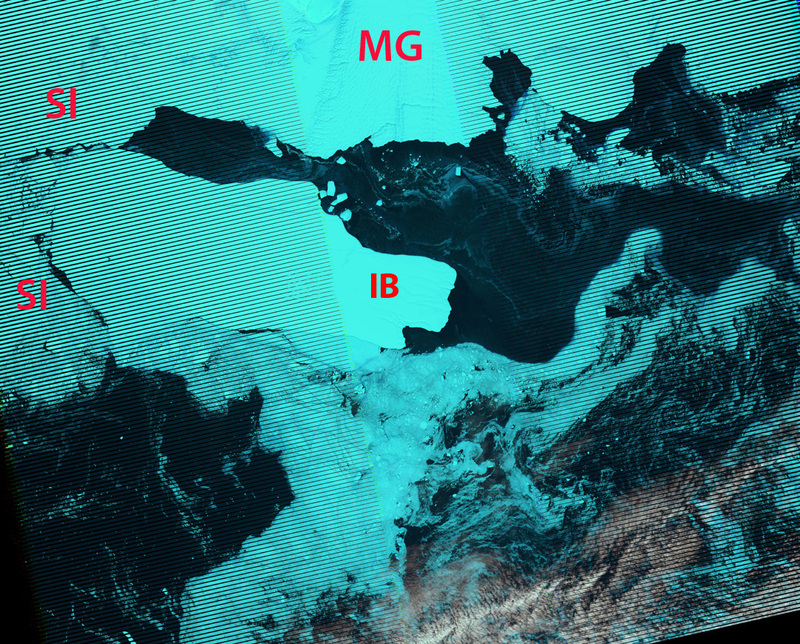 In the years after the calving event there was a breakout and melt of thick multiyear sea ice released by the movement of iceberg B9B and the MT. The sea ice that was stable on the east side of the Mertz Glacier tongue, broke out from the coastline, and continues to not be as develped as before. Here we examine the floating tongue in Landsat and MODIS imagery from 2001-2013. 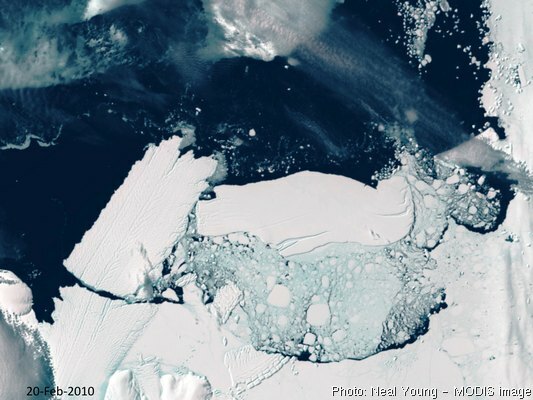 In 2001 the floating had a rift crosscutting 30% of the eastern side of the ice tongue. By 2003 the rift had completely crossed the ice tongue. East of the tongue note the area of sea ice (SI). 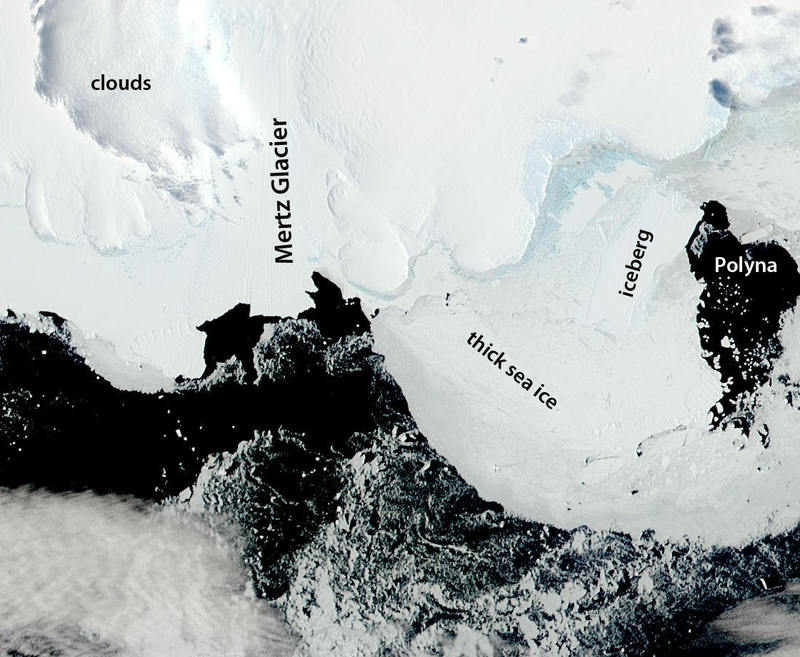 In 2007 and 2008 little has changed, again note the sea ice pinned to the east side of Mertz and the lack of sea ice to the west of the glacier. Than in 2010 and 2011 the tongue is broken off, and is not in view. 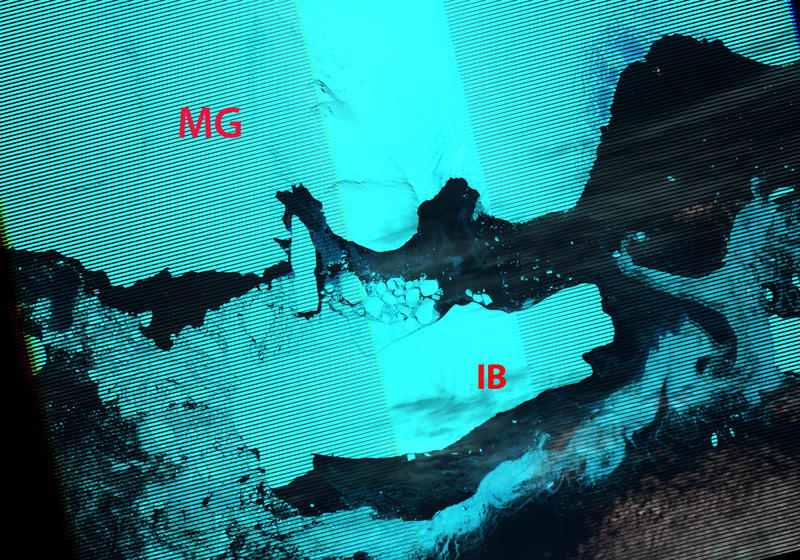 The B9B iceberg is still in view (IB). 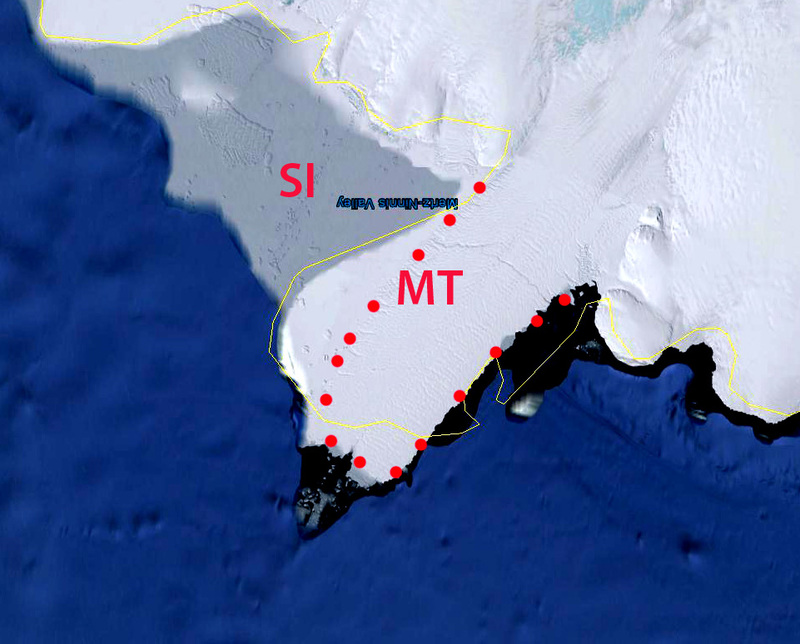 The main change is the area of sea ice east of the former tongue is no longer as extensive and the open water west of Mertz Glacier is now has considerable sea ice. 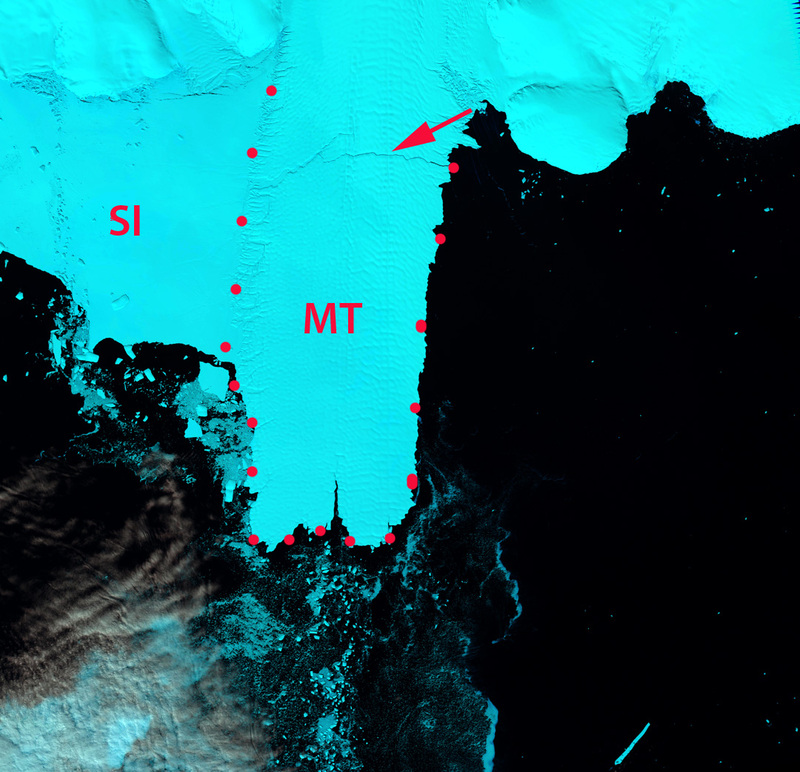 On January 3 2014 MODIS imagery indicates the extensive sea ice that exists west of the Mertz Glacier, and the region where both the Russian vessel, Akademik Shokalskiy, and Chinese vessel, Xue Long, became stuck in the ice. The vessels were stuck for ten days, broke free on January 8. Mertz Glacier is a large outlet ice stream of the Antarctic Ice Sheet. 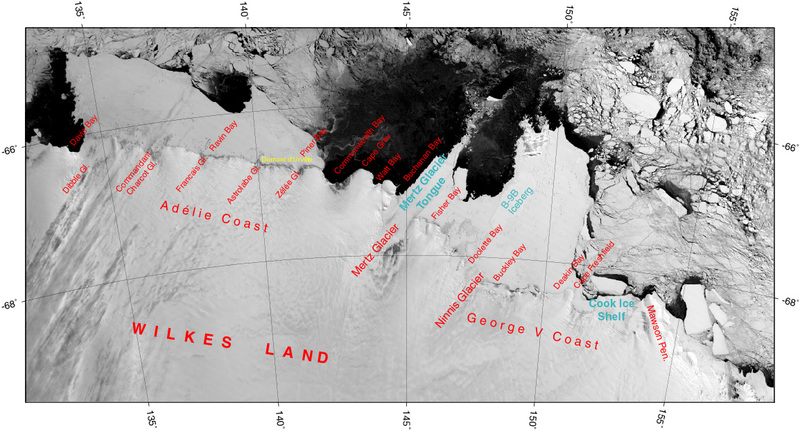 It differs from Pine Island Glacier in having lower basal melt rates, and that basal topography beneath the ice stream does not remain deep well inland of the coastline. This entry was posted in Glacier Observations and tagged mertz Glacier, Mertz Glacier tongue break off, Mertz Glacier velocity basal melt. Bookmark the permalink.